Amazon.com had me at FREE SHIPPING. I've been ordering from this site for years. It was an excellent source of deals during my college days for inexpensive textbooks with an added bonus of already highlighted information...and the occasional shoe purchase. Amazon.com literally has everything! Trust me. I would know, as much time as I spend on the site. I stalk items to see if the price drops. 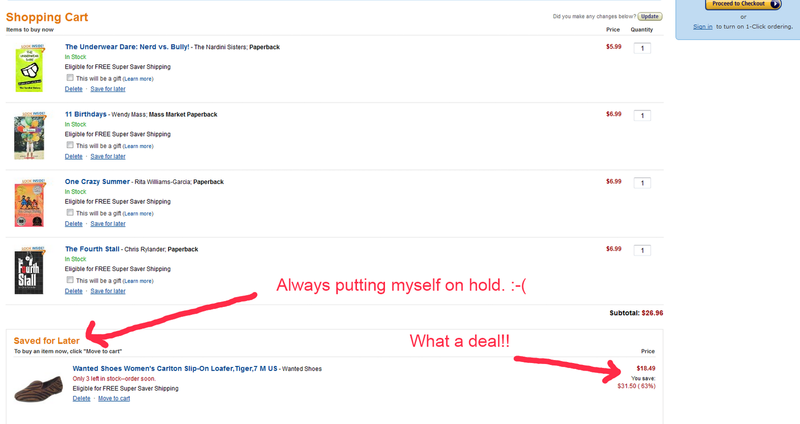 But more importantly, I order a lot of books from the site for my son. He likes to read, so it's equivalent to going into a candy store and having endless possibilities...without the sugar. It's hard to tell, but I found a few great books. I ordered two for Kaden and two for my little cousin. 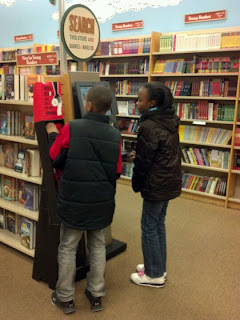 I figured they both like reading, so why not feed their brains? If you notice at the way bottom of the picture above, there area a pair of flats in the 'Saved for Later' column. Somehow I always find a way to put my purchases on the back burner. I think there is something in the make-up of parents, specifically mothers, that screams, "I'm not a priority!" I promise, I'm working on kicking that baby to the curb. Hmph! I quickly got over my lack of you-derserve-another-pair-of-shoes-ness. Once I made it to checkout, I realized there was a super deal going on. I had no idea. 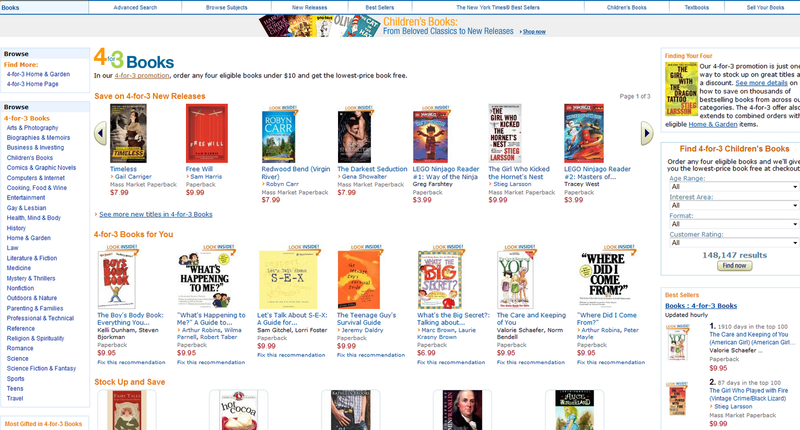 Right now, Amazon.com has a 4-for-3 promotion taking place in Books and Home & Garden. Don't quote me on that. 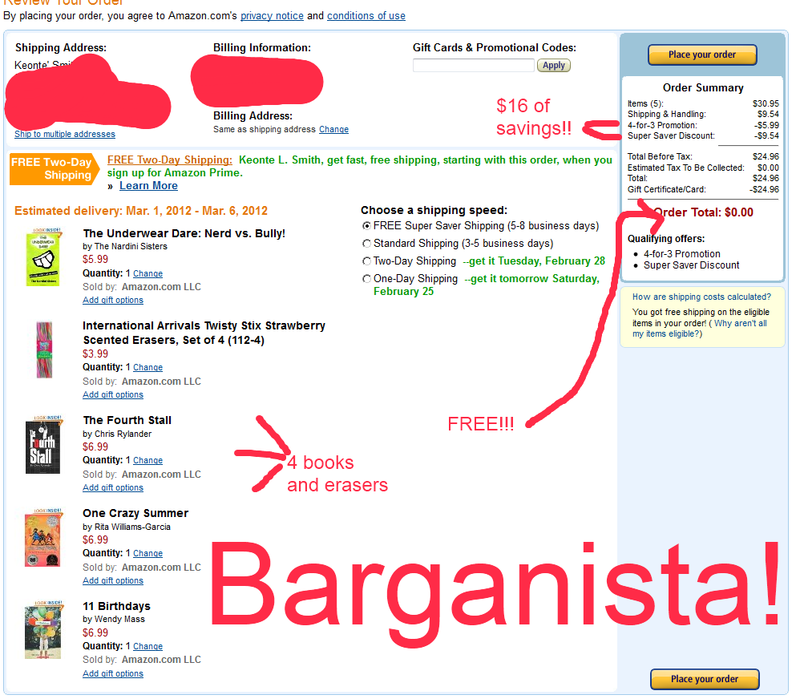 The site says: "In our 4-for-3 promotion, order any four eligible books under $10 and get thelowest-priced book free." I capitalized on my savings by ordering $25 worth of merchandise to qualify for Free Shipping. Holla! After using a gift code from Crowdtap.com, I paid a whopping...$0! I absolutely love Amazon.com and their amazing deals. I also like the fact that the recipients of the books will honestly appreciate them.